The scary movie “Creature from the Black Lagoon” premieered back in 1954, and almost 60 years later, the Swedish game developer NetEnt created a slot machine based on this monster film after inking a license aggreement with the movie studio Universal. 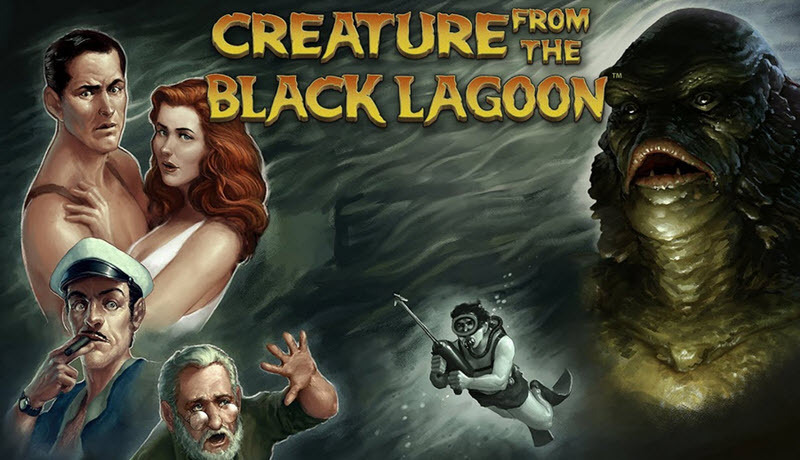 The Creature from the Black Lagoon Slot is a suitable choice if you are in the mood for a slot filled with special features. There are several different wild symbols, you can get re-spins, and the free spins round feels like a bonus game since there’s so much interactivity. To honor the epoch when the movie was released, NetEnt created this slot in a wonderful 1950s style. If you have seen the film, you will recognize the characters that show up as symbols on the reels: the skipper Lucas and the scientists Carl, David and Kay. Their tools can also make an appearance, e.g. scuba diving air tubes, camera, binoculars, and knives. The scary Creature can not be seen during the basic game, but can show up in Free Spins mode. You always play with all 20 paylines active on this slot, but can adjust the coin value and also select how many coins to bet per payline, from 1 to 10 coins per line. The regular wild symbol can substitute for any regular symbol, but not for any of the special symbols. The Sticky Wild symbol can substitute for any regular symbol, but not for any of the special symbols. When a Sticky Wild appears, it will freeze in place while the other reels spin again, givingyou another chance to win. If any new Sticky Wild appears, the process is repeated, so this can be a very lucrative and long-lasting event if you are furtunate. The Spreading Wild symbol can substitute for any regular symbol, but not for any of the special symbols. The Spreading Wild can only appear during the Free Spins round. Exactly how powerful the Spreading Wild is depends on your level in the Free Spins round. For more information, see below. If you get at least 3 free spin symbols, it will trigger the Free Spins round. 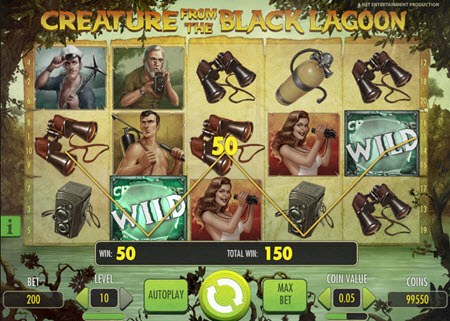 During the Free Spins round, Kay will be captured by the Creature from the Black Lagoon. Your job is to free her by shoting the Creature. If a reticle (crosshair) appears on the fifth reel, use it to take aim at the Creature before shoting. If you manage to hit the Creature, it will get weaker. For each hit, the Creature’s health meter will drop. (You can see it in the bottom right corner of the screen.) The meter have four different levels, and the current level determines which special features that may help you during the free spin. First level: You may get help from a Sticky Wild with Re-Spin. Second level: You may get help from a Spreading Wild with Re-Spin. Third level: You may get help from an even more powerful Spreading Wild with Re-Spin. This wild spreads to both the right and the left. Fourth level: Just as on the third level, you may get help from the powerful Spreading Wild with Re-Spin, but you might also receive 10 new free spins.